Yesterday’s Le Figaro included an announcement of the death of former French SOE agent Gilbert Turck, at the age of 101. Turck was born in Montreal but grew up in Paris, where he trained as an architect and worked for SNCF. At the outbreak of war he was a liaison officer with the French Cinquième Bureau, which had close links to SOE's precursor, Section D. It was through this association that he was invited to join SOE by Leslie Humphreys, F Section’s first head (Humphreys had been the former Section D chief in Paris). For the sake of appearances Turck was commissioned as a British officer under the name of George Tunmer, even though he could barely speak a word of English. Gilbert Turck was not a lucky agent. In August 1941 he was parachuted near Montluçon to make contact with his French Intelligence colleagues now working within Pétain’s Vichy government. His partner Jacques de Guélis, a giant of a man, exited the aircraft perfectly, but the much shorter Turck bashed his head and managed to knock himself out. When he came round he was lying in a police station, with two gendarmes standing over him. He told them that he had hated the English so much, he’d bribed the RAF to bring him back to France, but they didn’t seem to care whether he was lying or not. After an unsuccessful escape attempt he got word of his arrival to his old French boss Commandant Brochu, who arranged his release several days later. In Marseille he rented a safe house, the Villa des Bois, and began travelling across the country, visiting his wireless operator Georges Bégué in Chateauroux, and a former French Cinquième Bureau colleague, Captain Zundel, in Lyon. When Zundel warned him not to return to Marseille - he’d heard that the police were watching his villa - Turck attempted to warn Bégué and London of the danger to other agents; unable to contact them, he fled to Paris. One by one, the police lured Bégué and his associates to the Villa des Bois, and by November a dozen agents were in prison, effectively wiping out F Section’s presence in southern France. After changing his identity to “George Delanoe”, Turck contacted Pierre de Vomécourt, who was now SOE’s chief organiser in France. De Vomécourt had set up fake businesses in Paris which offered a front for his resistance work, and agreed to finance a truck transport firm for Turck (de Vomécourt wanted to use it as a means of moving parachuted arms and supplies). It seemed that Turck was safe, but in April 1942 de Vomécourt was arrested, and then news arrived that the police warrant for Turck’s arrest had been extended into the northern, German-occupied half of France, which put him on the Gestapo’s wanted list too. Turck began making plans to return to London through neutral Spain, but on 7 July he was arrested when leaving Les Deux Magots, probably given away by a contact he’d met earlier. Months of interrogation at the Gestapo’s HQ on the rue des Saussaies followed, but neither he, nor his fiancée who had been arrested the day after him, revealed the existence of the transport company, Turck’s mission or any of his contacts. The questioning stopped in February 1943, and he was kept in solitary confinement at Fresnes prison, during which time he nearly escaped, squeezing between the bars of his window (he was severely punished when recaptured, but his ingenuity reportedly earned the praise of the prison commandant). In January 1944 he was moved to Compiègne, where he intervened in the beating of a black prisoner (and got badly beaten himself) before being deported to Buchenwald concentration camp. When German guards discovered that he'd been sawing through the panel of the railway carriage during the journey, they beat him up again and left him naked in a freezing empty carriage for three days. Two months later he was transferred to the infamous Dora camp near Nordhausen, where he caught pneumonia. It probably saved his life, as the camp doctor secured him an office job as an architect. In April 1945 he was transferred to Bergen-Belsen, where he was liberated two weeks later. His trials were not yet over, though. In London Turck had been accused by Georges Bégué and several other surviving agents of being responsible for the arrests at the Villa des Bois. Turck was eventually cleared, the court concluding that the Vichy police had most probably planted a stooge to impersonate him when the agents came to visit the villa. It didn’t prevent Turck receiving the Military Cross and numerous French decorations. After the war he returned to work as an architect and later became mayor of his home town of Le Frestoy Vaux. Plans are underway to build a working replica of a motor torpedo boat that once belonged to the Shetland Bus flotilla, transporting SOE and SIS agents to and from Norway. Project supporters include Bond director Guy Hamilton, who served as one of the original boat's crew members. 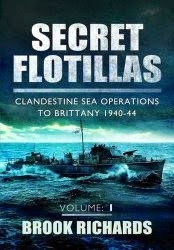 Once completed, the organisers intend to offer up to twenty customers a fortnight's 'holiday' aboard MTB 718, recreating the experience of clandestine operations on the North Sea.